In direct contrast to earlier posting, Tamiflu caught again the public attention - this time for far from envious reason. Two recent incidents - juvenile suicides without any underlying social cause, were widely published in Japan, including extensive coverage in two consecutive nights on February 26 and 27, 2007 by the national TV broadcaster NHK. Undoubtedly, the interviews with broken relatives of the young victims should increase the public awareness and hence to make parents closely monitoring the treated children. Yet, the science behind the frightening cases in Japan is not revealed. The holder of the Manufacturing and Sale Approval for Tamiflu in Japan is Chugai Seiyaku of the Roche group. The product was approved in two formulations in 2002, sold since then to millions and stocked for tens of millions. The world supply of Tamiflu is not unlimited, as Japan also uses the majority of the world’s Tamiflu supply for seasonal flu. Japan has used 24 million prescriptions - ca. four times more than the US. World-wide, since Tamiflu was first approved in 1999, 12 children under 16 years of age and taking the drug have died, and 32 have suffered “neuropsychiatric events” such as hallucinations, confusion, convulsions and brain inflammation. All the deaths and the vast majority of adverse events in children, also including skin rashes and sensitivity, have been reported in Japan, where Tamiflu has been most widely prescribed. For the fiscal 2006 year, the MHLW received 12.8 billion Yen in supplementary budget as 8 billions of which to be spent for Tamiflu (90%) and Relenza (10%). Back in 2005, both FDA and EMEA held discussions to analyze the frightening side events observed in Japanese children, but concluded that the “increased reports of neuropsychiatric events in Japanese children are most likely related to an increased awareness of influenza-associated encephalopathy”, increased use of Tamiflu in Japan, and greater monitoring of adverse events. Certainly, the voices that the exacerbated reactions to Tamiflu among Japanese pediatric patients may be related to ethic (pharmacogenomics?) cause are being heard, but still the overprescription theory rules. Jouhoublog is a joint blog - post or send comments to . The deaths of a number of juveniles exhibiting abnormal behavior after taking the antiviral drug Tamiflu have sparked growing concern in Japan, but the Ministry of Health, Labor and Welfare says there is no confirmation of any causal link between such behavior and the drug. A group whose members say they are victims of Tamiflu-induced brain symptoms said that even if such a link has not been confirmed, doctors should call patients’ attention to possible side effects when they administer Tamiflu, and parents should not take their eyes off children who have taken the drug. On Feb. 16 in Gamagori, Aichi Prefecture, a 14-year-old girl who lived with her family on the 10th floor of a condominium building fell to her death apparently after taking Tamiflu. The girl had not gone to school that day because she was ill, and a doctor prescribed Tamiflu for her in the morning. The prefectural police said she apparently climbed barefoot over a 1.3-meter-tall barrier in the outside corridor and fell to her death while the rest of the family was out. No suicide note was found, and a friend of the girl said, “She would never commit suicide.” A representative of the group, 49-year-old Haruhiko Nokiba, said that in 2004, his 17-year-old son walked onto a national highway shortly after taking Tamiflu and was killed by an oncoming vehicle. He also said two boys who fell to their deaths from condominiums in Aichi and Okayama prefectures in 2005 and last year, respectively, had also exhibited abnormal behavior after taking the drug, and he believes the actions were related to side effects. On Tuesday in Sendai, a 14-year-old boy fell from the 11th floor of a condominium after taking Tamiflu the day before and died. Police are continuing to investigate the circumstances. A research team of the ministry carried out a survey covering about 2,800 people in Japan last November and said it found no evidence of a relationship between the drug and abnormal behavior. There was no such behavior among 54 Tamiflu-taking patients who had died as of the end of January this year since marketing of the drug began in February 2001, the ministry said. Tamiflu is produced by Switzerland’s Roche healthcare group and imported by Chugai Pharmaceutical Co. of Tokyo. The drug, also known as oseltamivir phosphate, will curb the growth of A- and B-type flu viruses, and if taken within 48 hours of the start of symptoms, fever will go down and recovery is said to be a day earlier than other drugs. In May 2004, Chugai added “consciousness disorders and abnormal behaviors” to a column of side effects in an appended paper attached to Tamiflu, but the company said it is a precautionary measure. At this stage, there is no need to single out the possibility of abnormal behaviors,” a ministry official said. But Rokuro Hama, head of the Japan Institute of Pharmacovigilance in Osaka, said, “There is a problem in the research team’s data. As far as behaviors immediately after taking the drug are concerned, the ratio of exhibiting abnormal behavior is four times greater” than publicly reported. The ministry team is now carrying out a fresh survey covering 10,000 people with the aim of completing the results by fall. “We really need to establish whether there is any causal relationship with Tamiflu,” said chief researcher Shumpei Yokota, a professor in the graduate school of Yokohama City University. Takashi Arai, 50, a resident of the city of Kyoto and a member of the group of victims, visited a ministry official last week and said, “In prescribing drugs, some doctors carefully explain but some others just ask if drugs are taken or not.” In 2005, Arai’s son, who was in junior high school at the time, temporarily became violent after taking Tamiflu. Arai wants doctors, medical facilities and institutions to provide full information on possible side effects of Tamiflu to patients before they take the drug. The government is currently building a stockpile of the drug as part of its preparedness against an epidemic of a new form of flu. If the approval of Iressa happened to be if not a cloud, but at least cloudy, it also has a silver lining. Both in response to the public criticism and along with the newer obligations concerning the pharmacovigilance, the authorities have decided to start disclosing information on advirse events (AEs) reported for medicines approved in Japan. Although it is hardly to assume that the disclosure step has been prompted solely by the Iressa saga, yet the reaching of Iressa incidents to the general public nonetheless served as a catalyst. Remarkably, the AEs data - previously elusive even to professionals, are now readily open to the public. Many pharmaceutical companies in Japan have fallen to third party providers to make available even for professional audience - such as physicians and pharmacists, and even the most innocent pieces of information - such as photographs of the packages, against charges and detailed registration. The Government took an opposite approach to have all the data posted at no charge and accessible without any tracking. Commendable. Femara - an aromatase inhibitor - is known to be submitted and currently under a review by the Japanese regulatory authorities. Yet, as distributed today by the mass media, the warnings issued by Novartis AG were forwarded to the physicians in Japan as well. As read between the lines - under the provision of the Pharmaceutical Affairs Law (PAL), any unapproved drug could be imported for individual use in Japan as long as the custom official is shown a prescription by Japanese doctor. Obviously, Femara (the name is misspelled in the original news release below) - another of the unapproved anti-cancer drugs in Japan has been imported by significant number of female patients treated domestically. TOKYO — A Swiss pharmaceutical company has decided to warn gynecologists in the United States, Japan and other countries not to prescribe women a breast cancer drug during pregnancy or before menopause, as it may harm unborn children, officials of the its Japanese associate said Wednesday. Letrozole, distributed by Novartis AG under the name Femera, is commonly used to prevent relapses of breast cancer. Animal tests have proven that the drug can cause fetal abnormalities and its use in pregnant and pre-menopausal women has been banned. In Japan the Pharmaceutical Affairs Law (PAL) permits individual import of both approved and unapproved drugs, as long as you have a prescription from Japanese physician. Should we expect the Tamiflu to crash this winter the previous individual import record of Thalidomide (reportedly about 500,000 tablets were imported before the approval)? Tamiflu is sold in Japan in two formulations: 75 mg capsules and 3% dry syrup, as the cost for 1-day treatment is 727.4 Yen for capsules and 1,392.5 Yen for the syrup. A sudden scramble for an imported influenza drug has raised the price charged by private import agencies to nearly 10 times the price offered by domestic pharmaceutical companies, it was learned Tuesday. Online purchases have depleted stocks. One agent offers 10 capsules of Tamiflu, or oseltamivir, imported from the United States for 30,000 yen, excluding shipping charges. "One U.S. company recently told us the price had risen to more than 300 dollars. We need to raise ours to 38,000 yen just to show a profit," the company’s president said. According to the company, which has acted as an import agent for six years, demand for Tamiflu remained low until last year when 10 capsules could be obtained for 8,000 yen. The government in 2001 designated the drug to be covered by national health insurance. Purchase orders for Tamiflu surged early this month following an increase in news reports on the spread of a new type of influenza and the government’s announcement of its plan to further stockpile the flu-fighting drug. The company received orders for about 20 sets in the past week. Another agent, which offers Tamiflu for 25,000 yen, said it was out of stock and had a waiting list of about 100 people. 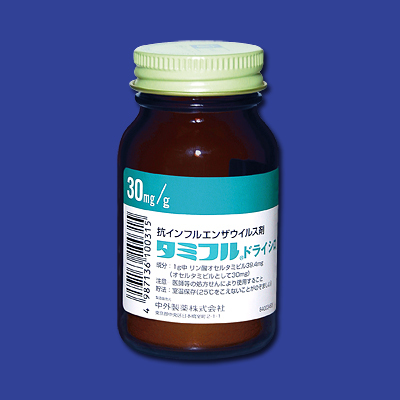 Chugai Pharmaceutical Co., which imports and markets Tamiflu, prices the drug at 363.7 yen per capsule. A dosage of two capsules a day is normally recommended for five days, and a set of 10 capsules is offered at 3,637 yen. Insurance coverage reduces the price to about 1,100 yen, but it requires a doctor’s prescription, which increases to the total cost to about 3,000 yen. We are receiving periodically inquiries regarding "quasi-drugs" in Japan, including about one recently mentioned. "Quasi-drugs" are the second category among all regulated medicinal products in Japan (along with drugs, medical devices and cosmetics). It is not clear how and when the term emerged, however the origin could be traced to the first translations in 1980s of the Pharmaceutical Affairs Law (Law). Current dictionaries only add to the confusion. English dictionaries define "quasi-" as resembling to some degree. On the other hand, the original Japanese term (iyaku gaibuhin) implies a drug used "outside" (i.e. not to be digested or injected). Bilingual (translation) dictionaries are even more helpless giving the meaning of iyaku gaibuhin as over-the-counter drug, unregulated drug (?!) and even the bizarre interpretation of AltaVista as "medicine public item". Neither is correct. Quasi-drugs are regulated products, sold with no prescription and thus falling, although not filling up the OTC category. The category of quasi-drugs now covers much more types of products than the classical quasi-drugs (for foul body odor and breath control, hair removal, body pests extermination). The PAL in Article 2 defines quasi-drugs as not equipment or instruments and having no more than a mild effect on the human body. The aromatic anti-Legionella cleanser for bathtubs may fit well into the definition, but how about the growing line of dietic products labeled as quasi-drugs? That’s it! For full seven years since the launch in 1998, Viagra has been used by only 1% of the world’s male population. Is this more, or less or in the range of what has been expected? Given the massive advertising campaign (over 100 million US$ in US alone), the unprecedented public interest and brand awareness, the common belief was - and likely still is, that Viagra is already taken virtually by everybody. One of the very prompt questions following the Eril mystique posting asked about www.eril.jp. Against all educated guesses, it turned out not to be a product site of Asahi Kasei. It is online shop of small distributor of cosmetics, dieting and beauty goods, doing business as "Eril" and on the top of its catalog under number Eril ck01 is a product named "Hairless Milk". Should we mention it here? Whatever hideous, the "Hairless Milk" is approved by MHLW in Japan as quasi-drug, otherwise there are no relations with cardiovascular Eril. But what about the 17-old trademark? Since 2001 we have received dozens of inquires about Eril. Surprising is also the span of the inquirers – from US testing laboratories to product developers in EU to university researchers. Why Eril? Eril (fasudil hydrochloride hydrate) was discovered by Asahi Kasei KK in 1980s. It is absolutely impossible to decipher the name of Eril, even knowing the typical for those years penchant for cryptic and “meaningful” abbreviations. The name of the pharmaceutical form Eril Inj. S stands for: Epoch-making relaxant for ischemic locality Injections Sun. Obviously afraid that somebody else might come with the same pearl, the maker registered Eril as a trademark in 1988 – more than ten years before the approval and much earlier before the clinical trials ever began. The picture on the left is the actual image deposited to the Japan Patent Office. Eril was licensed out in 2001 to Schering AG for development of antiangina oral formulation - it was then when the interest started to flow together with requests for samples of the compound and information. Both are scarce, particularly the latter. Unlike the medicinal products approved in Japan after the enforcement in 2001 of the Public Access to Information Law (PAIL), neither the Approval Review, nor the Summary Basis of Approval (SBA) are publicly available. Yes, the Package Insert – in its 7th revision from April 2005 made to conform to the amended Pharmaceuticals Affairs Law (PAL) is obtainable, however all other known documents – Drug Profile, Interview Form (a predecessor in Japan of the SBA), Pharmacopoeial Information are only accessible through a members-only commercial third party.